LvA’s work follows a two-pronged approach: PREVENTION and RESPONSE. In addition to providing integrated legal and psychosocial support services to victims when violence does happen, we seek to empower women and girls in Diepsloot, providing them with the tools to challenge the conditions that lead to the existence of violence in the first place. Through our community engagement programme, dedicated LvA team members work tirelessly to reach far and wide into the Diepsloot community through clinic talks, local radio programming, school workshops, community workshops, and other outreach events. In doing so, we seek to educate and empower young women, learners, teachers and community members at large to catalyse change around gender-based violence (GBV). One such initiative is LvA’s Community Action Group, which launched in 2017. Action Group members are graduates of LvA’s GBV Workshop Series who want to utilise the information gained through the series to mobilise change in their community around GBV. LvA provides Action Group members with further training and skills development around community mobilization, activism, and project planning. While the Action Group is capacitated and supported by LvA, the Group is self-led and determines the shape and content of its advocacy strategies and outreach campaigns. In 2017, the Action Groups held an outreach event at the community mall to raise awareness of violence against members of the LGBTI community, conducted a door-to-door campaign to raise awareness around GBV and LvA’s services, and executed a community dialogue which took place during the 16 Days of Activism against Violence against Women and Children attended by over 200 community members and other stakeholders. 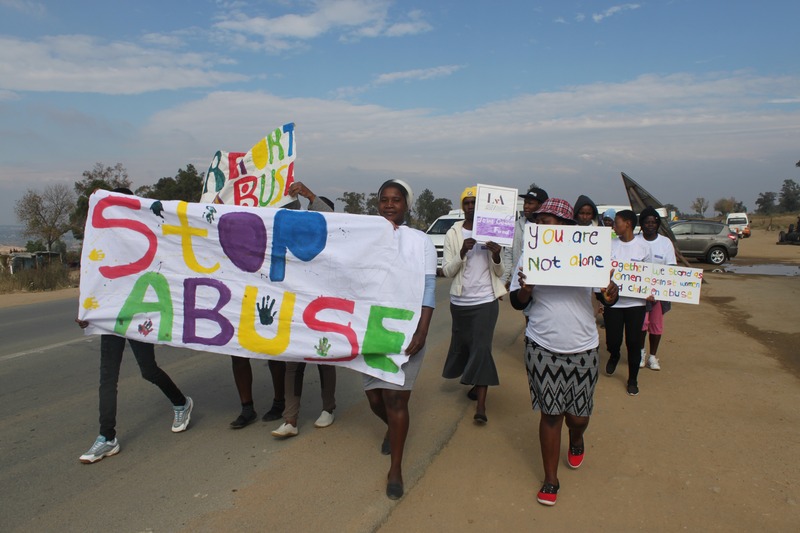 On 31 May, the Action Group held a March and Community Dialogue to raise awareness of high levels of femicide and abuse of women and children in the community. The event began with a march that wound along and through the streets of Diepsloot. Once inside the community, the group was joined by the marching band of the local metropolitan police department who then led the way, attracting a lot of attention and gathering additional community members along the way. The march ended at a local church where LvA and other stakeholders addressed the community members, sharing information about services provided and answering any questions that arose. This led to a robust conversation with those in attendance on issues around GBV and poor service delivery in the community. Upon reflection after the event, group members shared how participating in the Action Group gave them the understanding, skills, and confidence to speak out against issues that were affecting them and the violence that has become so normalised in their community.